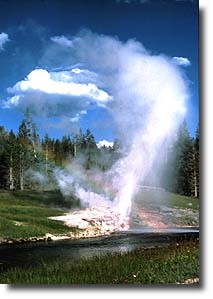 Situated on the bank of the Firehole River, Riverside Geyser is one of the most picturesque geysers in the park. During its 20-minute eruptions, a 75 foot (23m) column of water arches gracefully over the river. Eruptions are about 5-1/2 to 6-1/2 hours apart. There is water runoff over the edge of Riverside's cone for an hour or two before each eruption. Many geysers have similar "indications" that they are about to erupt.